It takes about four hours to drive south from my hometown of Sudbury to my house in mid-Toronto, Ontario. We’ve done the highway in cars, buses, big trucks, beat-up trucks and a few times I biked. Hitchiked, too. We’ve steered through raging thunder storms, blizzards and fog. But I really want to tell you about one of memorable trip that stands out from all the rest. It was a southbound run, Sudbury to Toronto. I was driving our red Dodge Caravan. Helena was riding shotgun. Behind us sat our daughters Ev and Ria and on the long bench at the back my son and my older-by-29-months brother Ed. About 30 minutes into the drive, Eddie asked me a riddle. I can’t remember what it was exactly, but I recall the format and the fact that it was directed at me. FOR MORE THAN AN HOUR! Helena timed it. Add this: Because of the audience, we kept our material Disney clean. But the G-rated numbers we tossed about in the van represented such a microscopic percent of our joke repertoire, I’m pretty sure that if we flung the joke gates wide open, we could have kept it up til we hit Patagonia. It’s not just me and Ed. My whole family’s like that. The more I think about it, the more I realize that wherever two or more Carters meet, they don’t converse as much as compete. On Planet Carter, jokes are as important as air. Remember a baker’s dozen paragraphs ago I mentioned the Sudbury house we grew up in? It had books in every room including the two johns, on every shelf and of every variety: novels, history books, Classic Comics (the only place I ever really read the real classics, btw,) nursing books with pictures of naked people, Readers’ Digest Condensed Collections, books about saints and miracles, and last and in a class of their own, “joke” books. 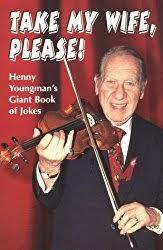 Books given over entirely to jokes meant for telling. Do they even print books like this anymore? is a friend of Ed's. 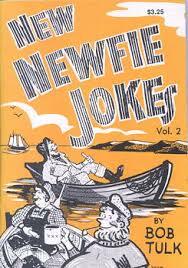 One I recall specifically was “New Newfie Jokes.” Clearly there is a earlier version with old ones. Were there like, thousands of Newfie jokes or what? I just thought of something. Remember I described how joke-filled that one drive from Sudbury to Toronto was? It just occured to me that all road trips with Eddie are like that. Him and me, swapping dumb jokes we learned at our mother’s knee. What a horrible waste of human brains.